Petite Opera invites supporters to a unique evening of wine and song. Entitled Vocal Palettes & Pairings, Petite Opera's May 18 event is a concert and wine tasting combined into one. Ten professional voices will be "paired" with wines to create a fabulously entertaining and educational treat for both the oral and aural palettes. Wine notes will be presented by a sommelier, and vocal notes by the singers themselves. Other than the idea of "wine and song", where did the idea for this event come from? "The idea evolved from several concepts", says Susan Baushke, Executive Director. "One evolved from an event we held in 2012, another from discussions with wine lovers, and another with opera lovers. Last year, for an outreach event, Petite Opera wanted to try something different to get across the idea that classical voices don't fall into just the standard choral soprano-alto-tenor-bass groupings. We wanted to explain the German concept of fach--which is a classification system that captures elements of vocal range, color, agility and weight. In explaining several of those factors, wine comparisons just naturally came to mind. The event was a hit, and patrons are still raving about it over a year later. There was not an actual wine tasting involved for that event--just verbal comparisons--so it seemed natural to take the concept further for a benefit event. We also know that there are patrons who love wine, but aren't quite sure yet about classical singing or opera, so this is the perfect chance for them to enjoy the wine, and be introduced to classical singing. For those that love opera, and like wine, but want to more about it, this event allows them to enjoy what they love, while being guided by a professional sommelier about wines." Only 100 tickets are being sold for this benefit event, and advance purchase or reservations are required. Reserve tickets at 847-553-4442 or petiteopera@gmail.com by May 15th. Cash, check and credit cards will be accepted at box office. 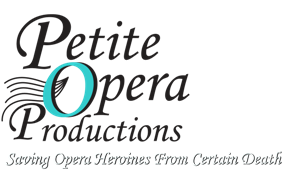 All proceeds will benefit Petite Opera, and go toward its general funds, as well as support its November 2013 Chicago Premiere production of Cosi fan tutte (Everyone is Just the Same), with a new libretto by Dimitri Toscas. Set in 1959, this Mozart comedy takes on a new twist. See upcoming events for details.